Mwanjela, Geofrey and Razack Lokina. 2016. “What does it take to be heard in managing marine protected areas? Insights from Tanzania coastal communities.” African Journal of Economic Review 4:1: . 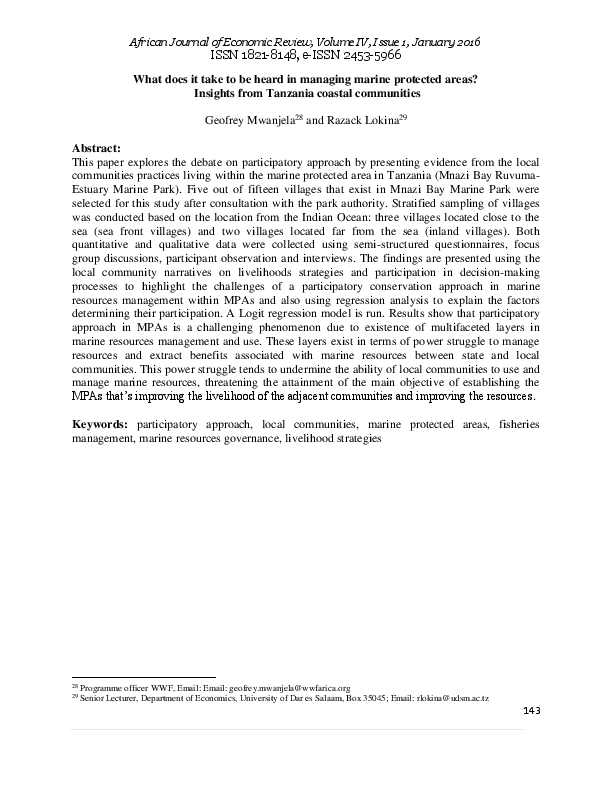 This paper explores the debate on participatory approach by presenting evidence from the local communities practices living within the marine protected area in Tanzania (Mnazi Bay Ruvuma-Estuary Marine Park). Five out of fifteen villages that exist in Mnazi Bay Marine Park were selected for this study after consultation with the park authority. Stratified sampling of villages was conducted based on the location from the Indian Ocean: three villages located close to the sea (sea front villages) and two villages located far from the sea (inland villages). Both quantitative and qualitative data were collected using semi-structured questionnaires, focus group discussions, participant observation and interviews. The findings are presented using the local community narratives on livelihoods strategies and participation in decision-making processes to highlight the challenges of a participatory conservation approach in marine resources management within MPAs and also using regression analysis to explain the factors determining their participation. A Logit regression model is run. Results show that participatory approach in MPAs is a challenging phenomenon due to existence of multifaceted layers in marine resources management and use. These layers exist in terms of power struggle to manage resources and extract benefits associated with marine resources between state and local communities. This power struggle tends to undermine the ability of local communities to use and manage marine resources, threatening the attainment of the main objective of establishing the MPAs that’s improving the livelihood of the adjacent communities and improving the resources.